Use these guidelines (plus some good old-fashioned common sense) to ensure that you and your little adventurer stay safe as you two explore the world as one. Every single element of the Boba Carrier—from fabric to finishing touch—is designed with your absolute safety in mind, and all you have to do is enjoy the ride. Security sure can look cute, can’t it? The Boba Carrier is intended for children from 7–45 pounds (3.1-20.4kg), and has been stress tested up to 60 pounds (27kg). Boba carriers are not designed to carry your baby facing out , and we only recommend using our three approved holds (front carry, back carry and the newborn hold). Be sure the fabric body of the carrier extends at least up to your child’s upper back and that the waist buckle clicks securely. If your baby is moving around a lot or stretching his legs out straight like a board, the carrier may not be adjusted properly or your child may be too big or small for a comfy carry. In this case, take your child out of the carrier. Regularly give your carrier a carefully once-over to be sure that the fabric and seams are all good to go. Remember to undo the foot straps and hold on tight when taking your baby out of the carrier. We wouldn’t want any tippie toes or ankles getting tangled on the way out. Adventure doesn’t have to wait until your baby gets older because you can embrace the closeness of babywearing right from the start using the carrier newborn hold. 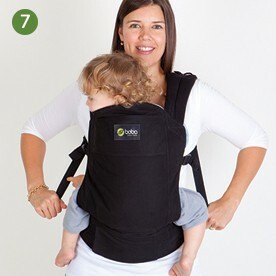 Perfect for babies 7–15 pounds (3.2-6.8kg) , this hold takes advantage of our fan-favorite feature: the Boba 4G Carrier integrated infant insert. 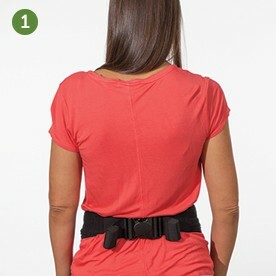 Fasten and adjust waist buckle at your back. If you will be carrying a 7–10-pound baby, snap the infant insert to form the ball shape. Leave insert unsnapped for babies 10–15 pounds. Bring both hands behind your neck and fasten chest strap. 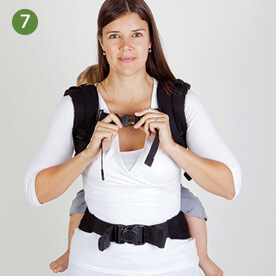 Adjust shoulder straps to leave room for baby (you’ll adjust again after baby is inside). Using both hands, carefully slide your baby into the carrier facing you. Babywearing with your little adventurer facing out is a no-go. If your baby is 7–10 pounds, his or her legs should be in the fetal tuck around the infant insert. If your baby is 10–15 pounds, his or her legs should be in an M position around the opened, unsnapped infant insert. 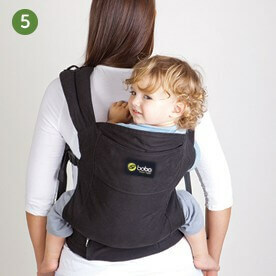 Adjust the shoulder straps and side adjustments so that your baby has total back support from the carrier. No slumping please. 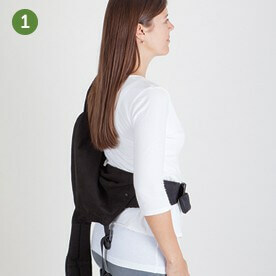 If you need a little extra head support, snap the removable hood across to the opposite shoulder strap. Your baby’s head should be resting on your chest facing either left or right, and his or her nose should be parallel to the floor or higher. Welcome to the most comfortable place to give your growing toddler his or her first memories of the world. 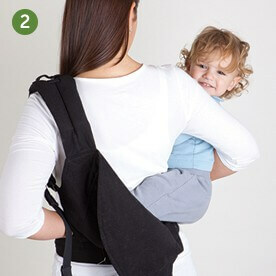 The back carry is designed for children 20–45 pounds (9-20.4kg). Now just fasten the chest strap at armpit level and you’re all set. NOTE: Boba removable foot straps are intended for use with shoes. Always undo the hook-and-loop closure on the foot straps before taking your child out of the carrier. Adjustability rules with the Boba Carrier. For perfect babywearing posture, adjust the shoulder straps so that your little one is close to your body and you can stand up normally without leaning forward to compensate for baby’s weight. 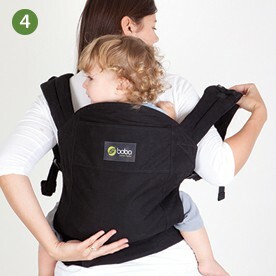 When nursing in the Boba Carrier, loosen the shoulder straps to allow your little one to drop lower in the carrier and latch on with ease (and discreetness). Boba don’t mess around when it comes to our materials. That’s why the Boba Carrier waist belt buckle is military-grade. To ensure the safest baby-and-me journeys, make sure you hear the buckle click when you put on the carrier. To keep your purse or diaper bag securely in place (you’re welcome, moms), just unsnap the shoulder strap holder, place your purse or diaper bag comfortably on your shoulder, and then re-snap to secure. Have a lot on your shoulders? No problem. 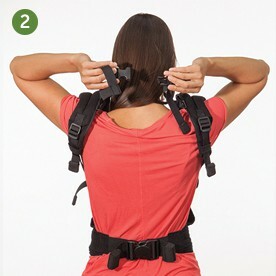 The Boba Carrier features shoulder straps on both sides, so you can lock and load bag straps on both sides. Not to mention the design is easy and convenient for both right- and left-handed users. As a parent, you’ve got a lot to lug around. Phone, credit cards, binkies…not to mention your baby. That’s why the Boba Carrier features a large zipper pocket on the waist belt so you can carry all the little odds and ends right along with your little one. Need quick access to stuff? Underneath the waist belt zipper pocket is another pocket for grab-and-go convenience of smaller items. 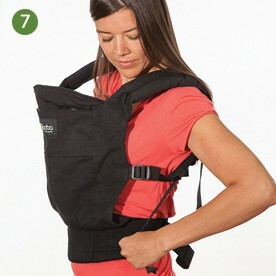 If two pockets aren’t enough, the Boba Carrier features a third pocket along the top of the carrier. Score. Just remove the sleeping hood and load ‘er up. The pocket even has a zipper to keep your things secure. Babies need a lot of sleep, so Boba built a perfect solution for when they drift off to dreamland in the Boba Carrier. Just pull the removable sleeping hood from the carrier pocket, grab one hood strap, extend it straight up toward the top of your head and secure with a snap. Awesome caution: this may result in longer, more restful naps. You can also use the sleeping hood to protect your child from wild weather—everything from sun protection to rain deflection. The sleeping hood is easily stowed in its own built-in pocket, so you can keep it zipped up and out of your way anywhere you go. You can also unsnap the hood altogether and use the pocket for other storage (see pocket points above). Give your growing tyke (starting at about 1 ½ to 2 years old) some extra leg support with the Boba Carrier removable foot straps. To use, simply thread the strap through the plastic sliding piece and snap so that your child’s thighs are at least parallel to the ground and his or her knees should be pulled up to hip level. Fasten at least two snaps on each foot strap for the safest support. Move the foot straps front to back by sliding the plastic attachment piece along the cording as needed. Note: the sliding buckle may take a few uses to break in, so don’t be discouraged if it needs a little extra tug at first. “Oops moment” avoidance hint: DO NOT remove the plastic adjustment piece. This disables the foot strap system and makes it unusable. Remember to undo the snaps and take your child’s feet out of the foot straps before taking him or her out of the carrier. The Boba Carrier may be machine washable, but that doesn’t mean it’s indestructible. Only washing when necessary will dramatically increase the life of your carrier. For little stains, just spot clean with soap and warm water and air dry. When you need the big-time clean of the washing machine, use a mild detergent and the delicate cycle. Air dry instead of machine dry to be nice to your carrier (and the planet). Say bye-bye to bleach. It’ll ruin the fabric, which would be a massive bummer for you and baby.